ScanTrust operates an enterprise SaaS platform that connects millions of products to the Internet by giving each of these products a unique digital identity in the cloud. With its copy-proof QR code, the company brings trust, transparency, and traceability to the supply chain. Cambio Coffee implemented ScanTrust’s unique QR codes on their packs in May 2018, to an enthusiastic response from customers. Currently, the roaster and the delivery company enter data onto the blockchain. The plan is to roll out the feature to the shipping company and eventually the farmers, to cover the whole supply chain. In the future, the two companies want to expand to other blockchain-supported initiatives, like “Tip your farmer”. ScanTrust operates an enterprise SaaS platform that connects millions of products to the Internet by giving each of these products a unique digital identity in the cloud. With its copy-proof QR code, the company brings trust, transparency, and traceability to the supply chain. 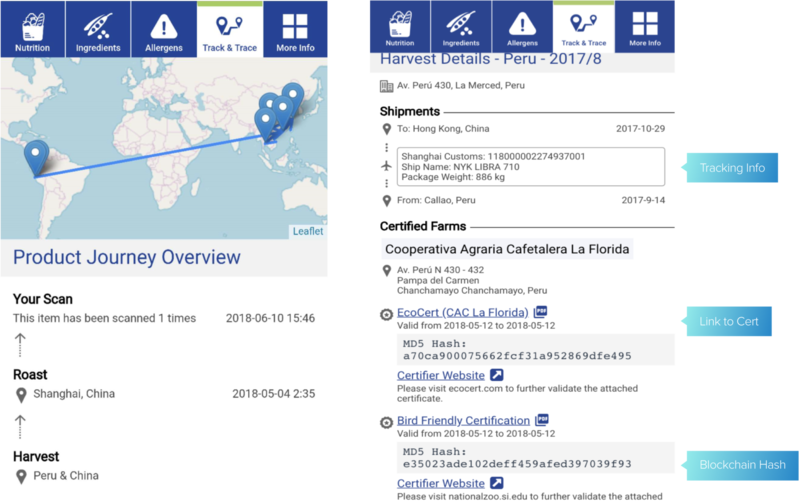 In order to enhance its offering in supply chain traceability, ScanTrust decided to look into blockchain technology. For a project that revolves around trust, the team felt it was crucial to use open-source technology. They were also looking for a reliable, proven solution with an active community behind it. Therefore they chose Hyperledger. Anderson explains, “Hyperledger has momentum, it is growing. We know that it’s not just us working on it; the product and the protocol will continue to evolve and become more robust.” Within Hyperledger projects and frameworks, the team felt that Sawtooth was the best fit for their needs because of its focus on IoT implementations. Hyperledger Sawtooth is a blockchain framework and one of the Hyperledger projects hosted by The Linux Foundation. With potential in many fields, from IoT to financials, Hyperledger Sawtooth has an architecture that recognizes the diversity of requirements across the spectrum with support for both permissioned and permissionless deployments. It includes a novel consensus algorithm, Proof of Elapsed Time (PoET), which targets large distributed validator populations with minimal resource consumption. Designed for versatility and scalability, Hyperledger Sawtooth was initially contributed by Intel. The ScanTrust team had been learning about Hyperledger projects and frameworks for some time, and once the project with Cambio Coffee came up, they quickly put together a proof of concept. It was well received, so the team rolled it out and started integrating it into their platform. The architecture involves a 3-node Hyperledger Sawtooth cluster; each runs a “coffee chain” Python transaction processor. ScanTrust combines information provided by the brand (like nutritional values) with data from the blockchain (events in the supply chain) and shows it to the consumers in their custom application. The ScanTrust team considers their blockchain implementation a success. “We were impressed by how fast the infrastructure is,” says Tobias Kars, VP Product Management at ScanTrust. “It is really lightning fast.” The team also appreciated the clear feedback on when a transaction is committed, flexible data storage and the simplicity of writing a transaction processor. Moreover, the Hyperledger Sawtooth team was there to answer their questions. ScanTrust has now contributed some of the code they wrote as templates to the Hyperledger Sawtooth database. Cambio Coffee has started putting the ScanTrust codes on their packs in May 2018, to an enthusiastic response from customers. Currently, the roaster in Shanghai and the delivery company enter data onto the blockchain (these include the date of entry, harvest date, the origin of coffee, roast date, etc.). 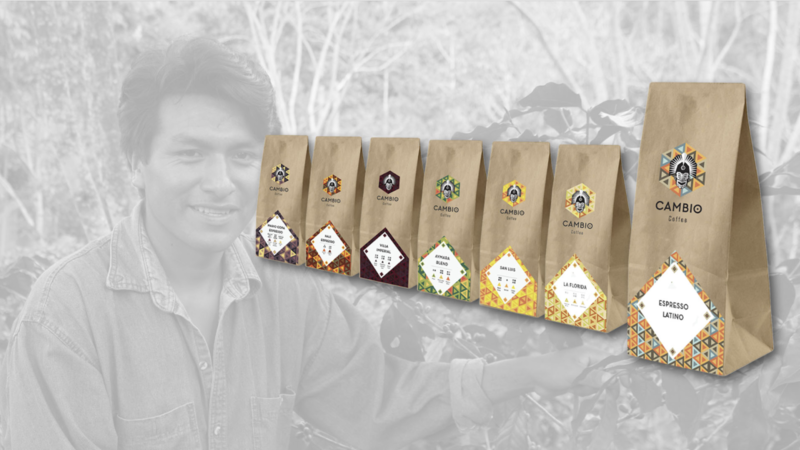 Cambio Coffee plans to roll out the feature to the shipping company and eventually the farmers, to cover the whole supply chain. 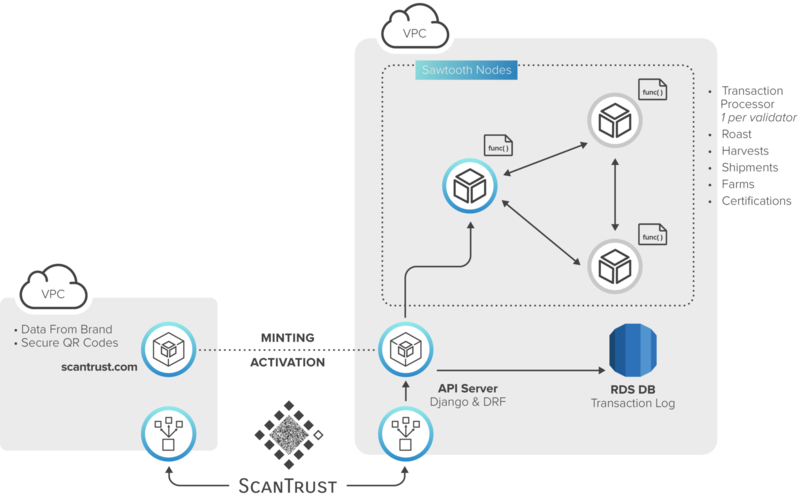 ScanTrust plans to use the Hyperledger Sawtooth-based solution for other projects. Besides enhancing traceability in the supply chain, the team sees other uses for the technology. For example, a brand could create its own token to incentivize consumers to share data; or it could develop ways to allow consumers to tip the farmer who produced their coffee. Founded in 2014, ScanTrust provides solutions that combat counterfeits, enable supply chain traceability and increase end-consumer engagement. Brands deploying ScanTrust can educate supply chain stakeholders and end-consumers through linking content to the secure QR code and blockchain technology. Brands can also increase engagement through various Calls-to-Action within the code technology and capture real-time supply chain and end-consumer data with the business intelligence and loyalty software. To learn more, visit scantrust.com.